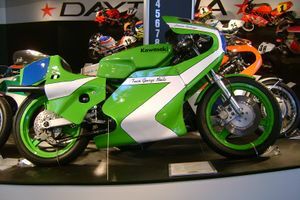 The Kawasaki KR's were built in 250cc and 350cc originally and were very successful over a five-year period, ending when Kawasaki pulled out of Grand Prix racing. The 250's won world titles from 1978 to 1981 and the 350's were victorious in 1978, '79, '81, and 1982. The narrow width and light weight, together with 70 horsepower, made these machines virtually unbeatable. This page was last edited on 26 August 2010, at 18:25.